Who doesn’t love apple desserts? Especially when they’re wrapped up in light and flaky dough. One of the down sides of most apple strudel recipes is that they use either puff pastry or pie dough for the outer wrap. While they’re both delicious, they’re also really high in calories and fat. In my recent quest to find a good alternative, I happened across the delightful Phyllo dough. I’m enjoying playing around with it, so I decided to try the traditional apple strudel recipe as an apple wrap with phyllo dough instead of pastry dough. It was delicious. It’s even more light than the traditional strudel recipes. 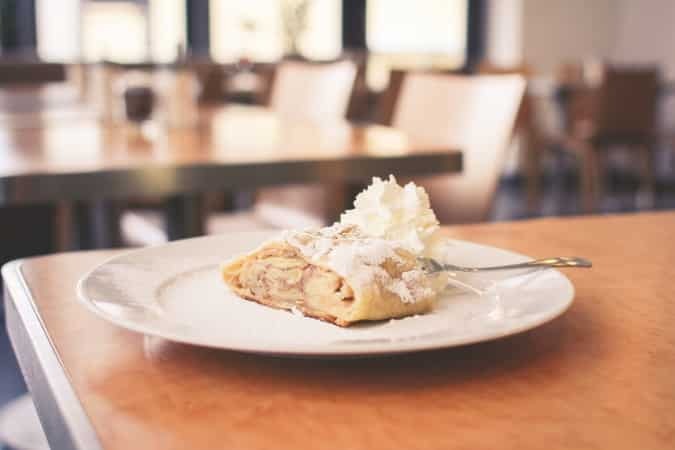 Typically, the strudel is a little more heavy, dense and rich. This is light, sweet but still tart and really delicious. I have to stop myself from eating more than I should of this one. I love the contrasts of the tart, crisp-tender apples and the light, flaky dough. It’s delicious, easy and I’ll definitely be doing this one again. A lighter, flakier and healthier version of the traditional apple strudel. This wrap is made with quick and easy phyllo dough, but the tart, crisp-tender apples lend the perfect contrast to the light and flaky dough. Combine the apples, sugar, cinnamon, vanilla and flour. Top the dough with the apple mixture. Fold the sides of the dough over the top of the apple mixture. Brush with the egg wash and sprinkle with cinnamon sugar. Slice several air vents in the top.